The Navy Jack flag has been in the news lately, as the Navy recently announced a change in their policy directing which of the two historically significant Navy Jack flags should be flown aboard Navy ships and crafts. This has stirred up some interest in – and confusion about – the Navy Jack flag, specifically because there are two of them. As flag lovers, we love to delve into the history and significance of flags, especially when things like this come up! We took a look into these two important flags to provide some insight into the change that’s happening and the background on the Navy Jack flags. What’s Going On With The US Navy Jack Flag? On February 21, 2019, the US Navy announced that they would be making a change as to which Navy Jack flag would be regularly flown aboard Navy ships and crafts. Starting on September 11, 2002, the First Navy Jack flag was the flag designated to fly on all US Navy vessels. As of June 4, 2019 that will be changing, and the US Navy Jack flag – also known as the Union Jack flag – will be flown on all Navy vessels. The Navy is also reestablishing the custom of having one warship (the commissioned ship with the longest period in active status, aside from the USS Constitution) authorized to fly the First Navy Jack flag, until that ship is decommissioned or becomes inactive. As of June 4, 2019 the only ship that will continue to fly the First Navy Jack is the USS Blue Ridge. Why Did The Navy Change Their Policy Regarding the Navy Jack Flag? The policy that took effect in September of 2002 designating the First Navy Jack flag as the flag displayed on Navy vessels was implemented exactly one year after the 9/11 attacks. It was originally intended to stay in place until the war on terror ended. However, the war on terror has been going on for more than 17 years and over the course of that time the Navy’s priorities have shifted. While it was at one time heavily involved in fighting terror and supporting counterinsurgency operations related to the terrorist attacks against the United States, the Navy is now becoming more focused on confronting and competing with rising rivals in other areas of the world. This change in the Navy’s focus inspired the change in terms of which Navy Jack flag should represent the organization on all ships and crafts. June 4 – the date that the shift in flag policy will take place – was selected because it commemorates the Battle of Midway, which is regarded as the greatest naval battle in US history. 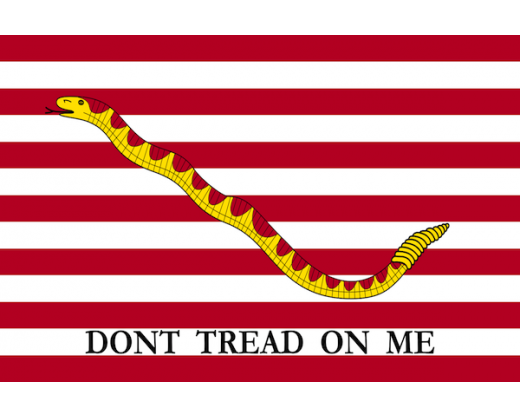 The First Navy Jack flag is a revolutionary war flag featuring thirteen red and white stripes with a rattlesnake and the words “Don’t Tread On Me” emblazoned across the center. The thirteen stripes are intended to represent the original 13 colonies that eventually became the United States of America. The rattlesnake is a historic symbol of resistance. This flag was likely developed in the late 1700s. While the flag has had various uses throughout the years, it has been most commonly used as a maritime flag by the US Navy. The Navy Jack flag – also referred to as the Union Jack flag, though not the same as the British Union Jack – features fifty white stars on a navy blue background. It is identical to the top left corner of the American flag. This flag was first flown in 1777, with additional stars being added to the flag as new states were added to the union. The Navy Jack flag represents the strengths that have made the Navy successful in battles such as Midway, which is part of why its re-emergence as the flag flown on all Navy vessels is so significant. Whether you’re a member of the Navy, a veteran, or you’re just a prideful American looking to participate in this change in Naval flag displays, we’ve got you covered! We carry both First Navy Jack flags and the Navy Jack flags, plus a wide variety of other nautical flags to meet all of your needs. Looking for the original Navy Jack flag featuring the thirteen stripes and the rattlesnake? Find it here. Need to update your Navy flag to align with the new policy? Find our Navy Jack flag here. We also carry a wide variety of nautical and marine flags, as well as Navy flags and banners that can nicely complement your Navy Jack flag on display. Have questions about the Navy Jack flag, or about displaying maritime flags in general? Give us a call at 1-888-697-3524 or contact us online and we’d be happy to assist you! As Marketing Manager, Maria handles all things marketing & advertising for Gettysburg Flag Works. Before joining GFW, Maria worked in a variety of marketing roles from category management to sales and marketing research. Maria holds a Masters in Business Administration from SUNY Albany and an undergraduate in Business with a concentration in Marketing from LeMoyne College. Outside of work, Maria enjoys time with her two boys Quinn & Declan, Saratoga race track with her husband Brian, and taking excursions with her friends & family. 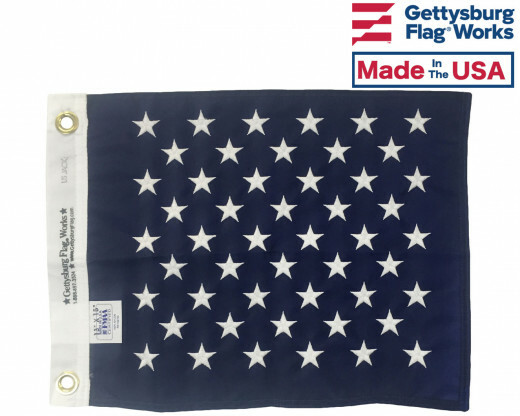 © 2019 Gettysburg Flag Works Blog. All Rights Reserved.